In what seems like an instant, Docker has become the benchmark for organizations to automate infrastructure, isolate applications, maintain consistency, and improve resource utilizations. 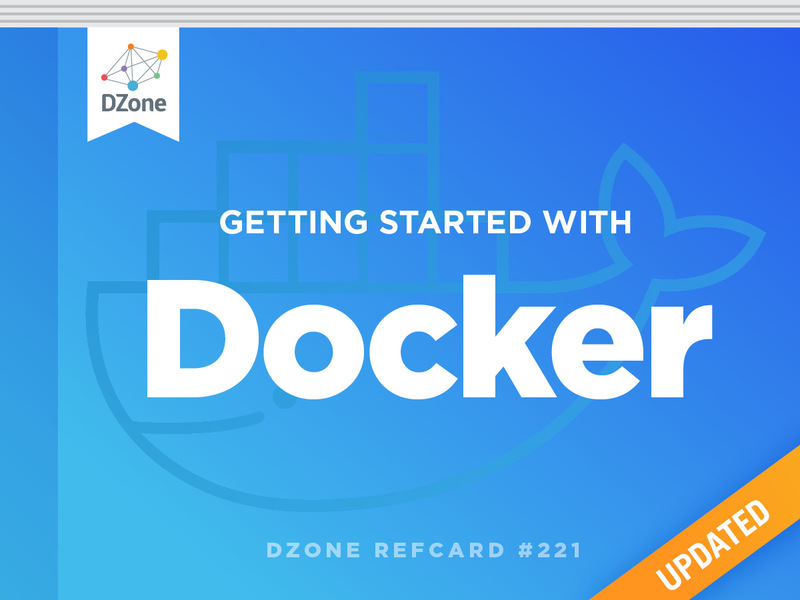 In this Refcard, learn how to run a container, explore several useful commands, and discover how to create local Docker machines. Almost overnight, Docker has become the de facto standard that developers and system administrators use for packaging, deploying, and running distributed and cloud native applications. It provides tools for simplifying DevOps by enabling developers to create templates called images that can be used to create lightweight virtual machines called containers, which include their applications and all of their applications’ dependencies. These lightweight virtual machines can be promoted through testing and production environments where sysadmins deploy and run them. Docker makes it easier for organizations to automate infrastructure, isolate applications, maintain consistency, and improve resource utilizations. Like the popular version control software Git, Docker has a social aspect in that developers and sysadmins can share their images via Docker Hub. Docker is an open source solution that is available as the free Community Edition or the subscription based Enterprise Edition for multiple platforms. Docker runs natively on Linux since Docker was originally built on Linux containers but it also works on Mac and Windows. Many enterprise tools have also grown up around Docker to make it easier to manage and orchestrate complex distributed and clustered applications architectures. Docker utilizes a client-server architecture and a remote API to manage and create Docker containers and images. Docker containers are created from Docker images. The relationship between containers and images are analogous to the relationship between objects and classes in object-oriented programming, where the image describes the container and the container is a running instance of the image. Docker Registry A repository of Docker images that can be used to create Docker containers. Docker Hub (https://hub.docker.com) is the most popular social example of a Docker repository. Docker Machine A utility for managing multiple Docker hosts, which can run locally in VirtualBox or remotely in a cloud hosting service such as Amazon Web Services, Microsoft Azure, Google Cloud Platform, or Digital Ocean. For Mac and Windows there are a few different options for installing the Community Edition. The modern way to install Docker is to use Docker for Mac (https://www.docker.com/docker-mac) or Docker for Windows (https://www.docker.com/docker-windows), respectively. The installs include the Docker platform, command-line, compose, and notary tools. An advantage of this approach is that it uses the native platform virtualization for better resource utilization. For Windows, this provides the additional benefit of being able to run Windows containers in addition to Linux containers, but not at the same time. Note: Docker for Windows requires Windows 10 Professional or Enterprise 64-bit. The alternative means of installing Docker on Mac and Windows is to use Docker Toolbox (https://www.docker.com/products/docker-toolbox). It includes the Docker platform, command-line (including Docker Machine), compose, Kitematic, and VirtualBox. The advantage of Docker Toolbox is that it runs on older versions of Windows and makes simulating some clustered scenarios easier. A downside is that it runs a Linux virtual machine in Virtual Box, which uses additional resources and means each virtual machine must be referenced using a distinct IP address instead of localhost. For Linux, each distribution has a unique way of installing Docker, so it is recommended you visit https://docs.docker.com/engine/installation/ for specific installation instructions. With Docker installed, you can begin running containers from the command-line. If you don’t already have the image you want to run, Docker will automatically pull or download the image necessary to build the container from Docker Hub and run it. After downloading the images and running the container, this command prints a “Hello from Docker!” message to standard output explaining all the steps that took place to display the message. Using the --rm option will also automatically remove the container and reclaim the disk space. Docker has a typical workflow that enables you to create images, pull images, publish images, and run containers. The typical Docker workflow involves building an image from a Dockerfile, which has instructions on how to configure a container or pull an image from a Docker Registry such as Docker Hub. With the image in your Docker environment, you can run the image, which creates a container as a runtime environment with the operating systems, software, and configurations described by the image. For example, your result could be a container on the Debian operating system running a version of MySQL 5.5, which creates a specific database with users and tables required by your web application. These runnable containers can be started and stopped like starting and stopping a virtual machine or computer. If manual configurations or software installations are made, a container can then be committed to make a new image that can be later used to create containers from it. Finally, when you want to share an image with your team or the world, you can push your images to a Docker registry. The easiest way to get an image is to visit https://hub.docker.com and find an already prepared image to build a container from. There are many certified official accounts for common software such as MySQL, Node.js, Java, Nginx, or WordPress, but there are also hundreds of thousands of images created by ordinary people as well. If you find an image you want, such as mysql, execute the pull command to download the image. If you don’t already have the image locally, Docker will download the most current version of that image from Docker Hub and cache the image locally. If you don’t want the current image and instead want a specific version, you can also use a tag to identified the desired version. If you know you will want to run the image immediately after pulling it, you can save a step by just using the run command and it will automatically pull it in the background. If you can’t find what you need or don’t trust the source of an image you find on Docker Hub, you can always create your own images by creating a Dockerfile. Dockerfiles contain instructions for inheriting from an existing image, where you can then add software or customize configurations. This Dockerfile example shows that the image created will inherit from the certified mysql repository (specifically the 5.5.45 version of MySQL). It then runs a Linux command to update the time zone to Eastern Time. More details on creating a Dockerfile will be provided later. This command will create an unnamed image. You can see it by running the command to list images. This displays all the locally cached images, including the ones created using the build command. docker build –t est-mysql . Listing the images again you can see the image is much clearer. There is an alternative option to creating a custom image besides writing a Dockerfile. You can run an existing image with bash access, then customize the image manually by installing software or changing configurations. When complete, you can run the docker commit command to create an image of the running container. This is not considered a best practice since it is not repeatable or self-documenting, unlike the Dockerfile method. The ps command lists all the running processes, the image name they were created from, the command that was run, any ports that software are listening on, and the name of the container. You will notice from the ps output that the container is listening to port 3306, but that does not mean you can use the mysql command line or MySQL Workbench locally to interact with the database, as that port is only accessible in the secure Docker environment in which it was launched. To make it available outside that environment, you must map ports using the –p option. Now mysql is listening on a port that you can connect to. But you still must know what the IP address is to connect. If you are using Docker for Mac or Windows or Linux it is just localhost. To determine the IP address for Docker Toolbox, you can use the docker-machine ip command to figure it out. Using default as the machine name, which is the default machine installed with the Docker Toolbox, you will receive the IP address of the machine hosting your docker container. With the IP address, you can now connect to mysql using your local mysql command line. A common use case is having applications in one container talking to services in another container, such as a web application talking to a database. You can simulate this by using the mysql command-line in one container talking to a MySQL database in another container represented in the figure below. In the example above, you start a new MySQL container that is automatically removed and using the it option it will start an interactive terminal in the container. The network option adds it to the mysql-network. bash is the application that runs when this container starts up and overrides the default start up behavior. Now within the newly started container, you can connect to the MySQL database running in my-est-mysql container by simply running the following command, where -h is the host using the name of the container. Another common use case is to share a directory or directories between the running container and the host machine. This is commonly done when the container contains a database and the data files want to be persisted and backed up from the host machine or during development when a developer wants to use their IDE on the host machine but run their code in a fully configured container. This is accomplished by using the v option to map the host directory to the internal directory. Finally, you are ready to push your image to Docker Hub for the world to use or your team to use via a private repository. First, if you haven’t done so already, you will need to go to https://hub.docker.com/ to create a free account. Next you need to login using the docker login command. When prompted, input the username, password, and email address you registered with. Now push your image using the push command, specifying your username, image name, and version number. After some time, you will receive a message that the repository has been successfully pushed. If you log back into your Docker Hub account, you will see the new repository. You have already seen how the docker ps command can list the running containers, but what about all the containers, regardless of their state? By adding the –a option, you can see them all. With a listing of all containers, you can decide which ones to start or remove. It’s often helpful to know what ports are exposed by a container, such as port 3306 for accessing a MySQL database or port 80 for accessing a web server. The port command can be used to display the exposed ports. If you want to ssh as root into the container, there is an equivalent exec command you can run to gain access to a bash shell, and since all the communications between the Docker client and the Docker daemon are already encrypted, it is secure. The run command is the most complicated and featured of all the Docker commands. It can be used to do things such as manage networking settings; manage system resources such as memory, CPU, and filesystems; and configure security. Visit https://docs.docker.com/reference/run/ to see all options available. As you have already seen, the Dockerfile is the primary way of creating a Docker image. It contains instructions such as Linux commands for installing and configuring software. The build command can refer to a Dockerfile on your PATH or to a URL, such as a GitHub repository. Along with the Dockerfile, any files in the same directory or its subdirectories will also be included as part of the build process. This is helpful if you want the build to include scripts to execute or other necessary files for deployment. If you wish to exclude any files or directories from being included, you have the option of using a .dockerignore file for this purpose. Instructions are executed in the order in which they are found in the Dockerfile. The Docker file can also contain line comments starting with the # character. This table contains the list of commands available. FROM This must be the first instruction in the Dockerfile and identifies the image to inherit from. This an example of the official MySQL 5.5 Dockerfile found at https://github.com/docker-library/mysql/blob/5836bc9af9deb67b68c32bebad09a0f7513da36e/5.5/Dockerfile, which uses many of the available instructions. Docker Machine is another command-line utility used for managing one or more local or remote machines. Local machines are often run in separate VirtualBox instances. Remote machines may be hosted on cloud providers such as Amazon Web Services (AWS), Digital Ocean, or Microsoft Azure. Docker Machines can be started using the docker-machine start command. Once the machine is started, you have to configure the Docker command line to determine which Docker Daemon it should be interacting with. You can do this using the docker-machine env command and evaluating it with eval. To stop a machine, use the docker-machine stop command. The docker-machine start and stop commands literally start and stop VirtualBox VMs. If you have the VirtualBox Manager open, you can watch the state of the VM change as you run the commands. For larger scale deployments that require orchestration, high availability, fault tolerant or are just plain complex, there are several tools that have grown up to simplify using Docker. Docker Compose (https://docs.docker.com/compose/) A tool for defining and running multi-container Docker applications. Docker Swarmkit (https://github.com/docker/swarmkit) A toolkit for orchestrating distributed Docker systems at scale. Kubernetes (https://kubernetes.io/) A tool production-grade container orchestration providing automated deployment, scaling, and management. Containers: Who Is Containing Them? Can Containers Really Ship Software?